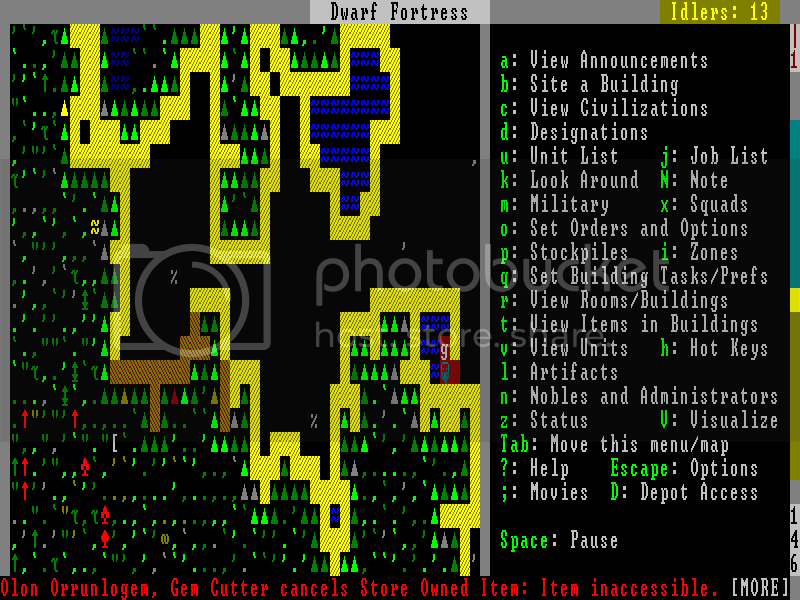 Re: Dwarf Fortress succession game - HELMAUTHORS HAS STARTED! Alright, done with the game-playing, the note-taking, and the image-editing. Now for the writing; the hardest part. Would you guys rather it all come at once in a mega-update, or should it be broken down into smaller bits? My plans can be altered to fit either one. Also: I have discarded this plan after some hard thought, but my original idea was to have the being that Amost worships, Nokor the Dead Phantom of Oblivion, be a malevolent deity (because with a name like that, how could you NOT be? )that would adversely affect Alath's mind, causing her to become manipulative and power-hungry. I discarded this idea, because I felt it'd fit better with one continuing fortress story, and a succession game's format kind of clashes. I still have a couple pages of notes on this idea, though. Is it too late to make it into the roster? This seems like the funtimes. One mega-update or many mini-updates? I think it'd be cooler to have several updates. Keep the content going in a sort of steady stream. Of course, if you want to get everything perfect before you post it, that's okay too. And about starting a plotline about the deity of death...It sounds like a good idea to me. However, one of the things about a "succession" story like this is that other people will put their own spin on things. It might be that later people will abandon all the plot stuff you come up with in favor of their own stuff. And, in fact, I think they should feel free to. We're really not trying to come up with a cohesive story, we're just trying to trade around save files. Maybe in a later succession game we might go for a cohesive, collaborative story, but it's not necessary for this one. So, if you want to write up your cool story, go nuts; just realize that someone else might abandon it. ZeuglinRush: I'll add you to the end of the queue. Other people might drop out or be shuffled around, so you might be up sooner than you think. 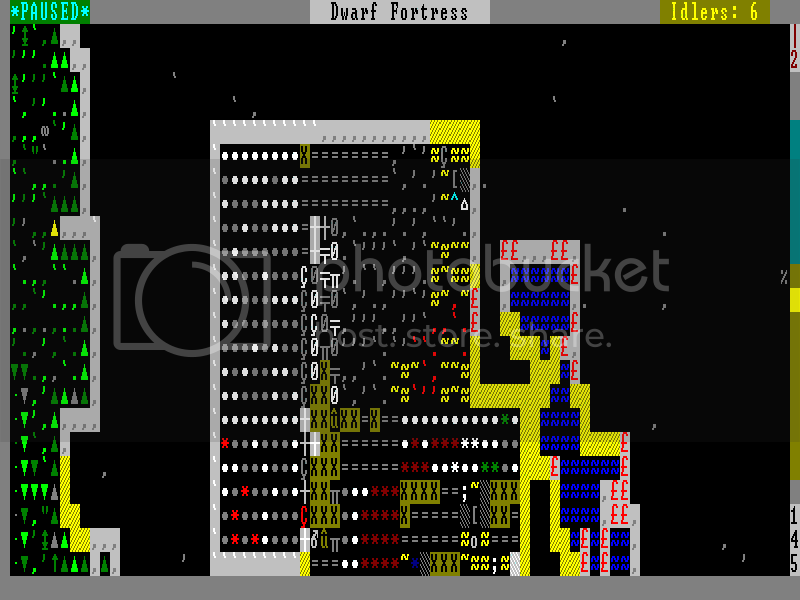 Edit: By the way, if you press Escape and go to "Export Local Image", you get huge .bmp files that show every part of the fortress. 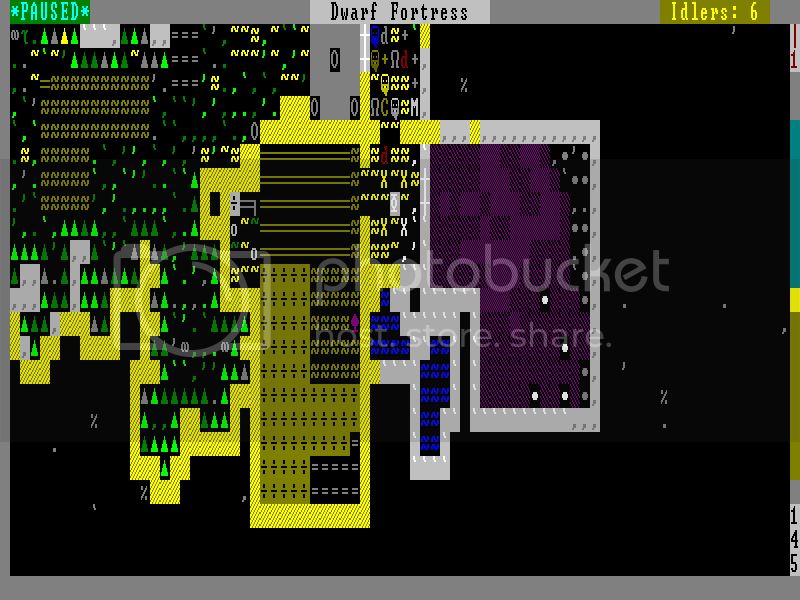 Then you can convert them to .png, or you can use the Dwarf Fortress Map Archive's tools to compress them. If you want to go through the trouble, of course. Count me in, if the game lasts that long! Uh and Chaos: What tileset are you using? I like it! As we all know dwarfs don't use hammers for inscription/masonry, they use their bare fists! And they also all have long beards and hair, there are no hairdressers in a fort! Kibble, you're in the queue. I tried out a bunch of character sets; the one I like the most is the "Unknown curses 12x12" one. However, I copied over the wrong tileset when I did the fresh install, and I only noticed after I'd taken a few screenshots. Still, it's not like it's horrible. Oh, and thanks for the neat picture. Hey guys, are we naming dwarves? Because I also want to be dwarfed. The following are excerpts from the diaries of a certain inhabitant of Helmauthors, one of the old colonies. We've chosen mostly those that seem relevant to the history of the fortress as a whole. Am writing this while eating in my room. These lax policies are really getting out of hand; someone once described me as being "slow to anger," but after a year of having no official place to eat, I'm getting pretty angry. I don't like to bother the other dwarfs, but I'll talk to Melbil about it tomorrow. "Well, Amost. what is it you wanted to talk to me about?" Melbil sighed. "What about it? Is it too big? Too small? Not legendary enough?" Melbil stared at me for a few seconds. "Not there? What are you going on about? It's on the second level, right across from my office. All the dwarfs eat there." "...No it's not. 'S not official." "Not... wait, are you saying it's not a dining room until I-"
Melbil rubbed the sides of her temples, as if to ward off a headache. "Alright, Amost, I'll make the announcement tomorrow and post a notice on the wall. The room that all the dwarfs have been eating in will now be the official dining room." 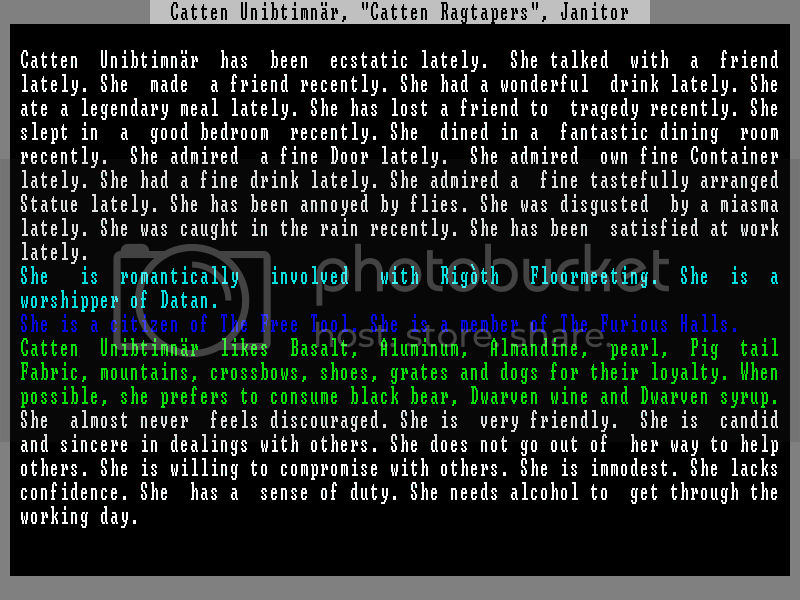 This is the first time I've ever made a demand of a governmental dwarf, and it worked! The system works! I'm so glad. Maybe I'll start involving myself in policy more often; there are a few things that need to be fixed around here. 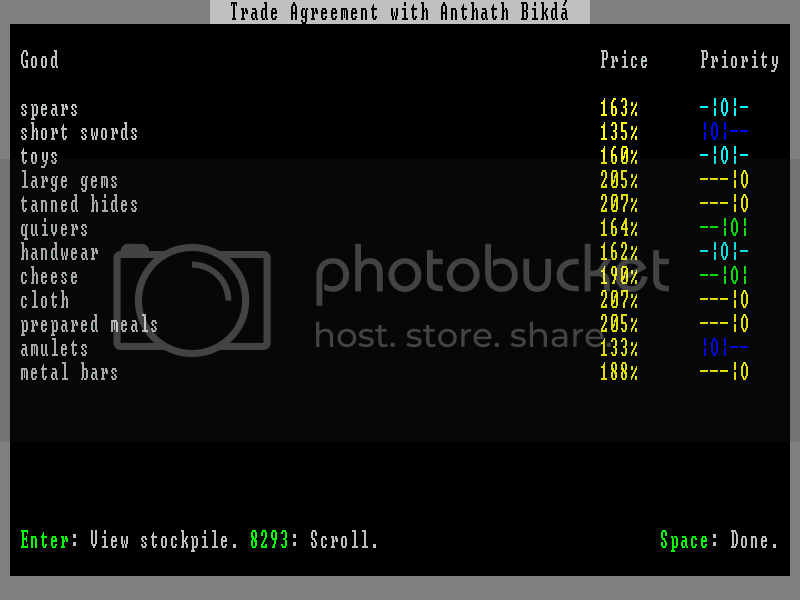 At the least, maybe I could keep that Alåth at arm's reach. She seems like a nice girl, but she's far too... bubbly for my tastes. I found something else that needs a bit of tightening up: somebody decided to store the refuse bin in the kitchen. I can kind of see the logic here; like after a bout of cooking, you throw your garbage onto the big pile. Unfortunately, it's not very practical. Unsurprisingly, having a huge pile of garbage in the kitchen makes a terrible smell. I tried to talk to Melbil about it, but she claimed she was so busy that she didn't have time for small details. But the day wasn't a total loss- I made a friend! At least, I think so; I haven't been able to find a universal definition. It was Obok! He started talking to me about my sudden involvement in local policies. I got the feeling he disapproved of it in general, but didn't hold any grudges. I don't remember exactly how the conversation went, but that's no surprise. It was odd having him talk to me after so long, but I think it was my sudden interest in the fortress' governing. Maybe it made him see that I'm more than how I might appear on the surface? Oh well. I'll talk to him again later, I'm sure! It's been a while since I've written here, but things have been busy. Y'see, I noticed that we had run out of space to store things made in the workshops... Actually, it was my darling Obok Cudgelscribed that let me know. I knew the place was crowded, but I didn't know if that was normal; engraving's more my thing. But when I went to visit him while he was working, Obok's carpentry shop was so cluttered, there were bins stacked almost to the ceiling! He said it was getting hard to work, and asked me to talk to Melbil about it. Normally, he assured me, he wouldn't get involved with things like that, but his carpentry was very important to him. I was already sympathetic, given that Alåth's gem workshop was right next to his. So I headed off to Melbil, whom I knew was in her office. I walked into the office, and there she was, busily working at her desk. I stared, waiting for her to notice me. She looked up, saw me, and quickly looked down again. I waited for minutes, but she seemed to be becoming more and more absorbed in her paperwork. She froze in place for a moment, and then looked up slowly. "Yes, Amost? Is there something you need?" "The workshops? Isn't there enough space already?" She looked taken aback, likely by my can-do attitude. I went on, deciding to outline in detail so that she could understand. 'The carpentry workshop is cluttered. There needs to be more room for storing things." "There's plenty of room for goods! Now, I have some very important business to attend to, so if you'll excuse me..."
I stood resolutely in the doorway; I've heard anecdotes about dealing with bureaucracy, and the best way to get what you want is to be stubborn. I decided to repeat the request. Melbil looked astonished for a second, and then turned slightly red. "Alright! The storage room will be expanded! Now please, just... leave me alone!" I turned and walked away without saying a word. I was really getting the hang of this policymaking thing! Anyway, a few weeks later, the mining was all done, and it's looking good! Obok was VERY grateful. You should have seen the way he looked at me. A HUGE amount of immigrants arrived today! Twenty-four of them, to be precise. One of them, Imush the cheese maker, tried to make some idle conversation with me, but I shut him down pretty quick. If Obok is as interested in me as I think he is, it wouldn't be proper to be talking to other males. He didn't seem to be too upset, though, and started in on Alåth instead. She talks to anyone, so they got along well. I doubt he'll remain a cheese maker for long, though; we don't have any milk here. In fact, a lot of the immigrants seemed to have useless jobs. I took it upon myself to correct that, and caught Melbil in the halls. I succinctly explained the jobs I felt would best fit some of the more... worthless immigrants. She didn't seem to understand at first, and tried to walk away, but I persevered. I think she's really starting to appreciate my side of things. 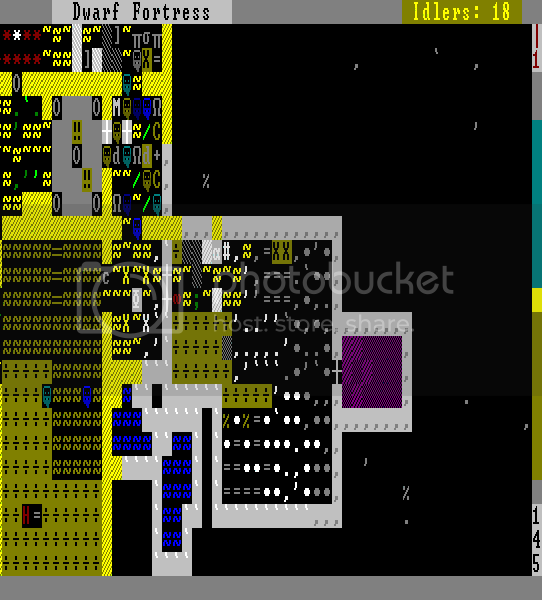 Anyway, Imush is now a Mechanic, a Potash Maker is now another Miner, and several Peasants are now training in more... fit positions. Including one that i felt we badly needed. Disappointingly, I forgot to have Melbil fix the garbage problem in the kitchen. Hmm, there seems to be a minor width problem on some pictures that didn't show up in the test posts... If it's a problem for a number of people, then I'll squeeze them up a bit. Anyway, this is the story of the first spring. It might be the season that the most happened in... anyway, the rest will get put up before the deadline. I was really motivated yesterday, but Photobucket was down. 'T was disappointing. I'd like to get in on this, but I just want to check. 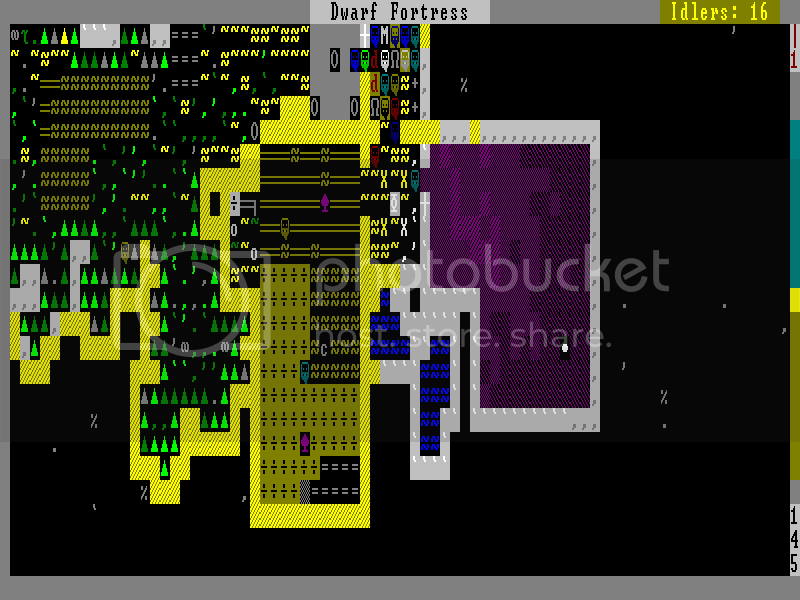 Will Dwarf Fortress Graphical work with the save file, I'm a pansy and I like the pretty graphics. Then, spend the rest of your day looking busy watching the janitor work. 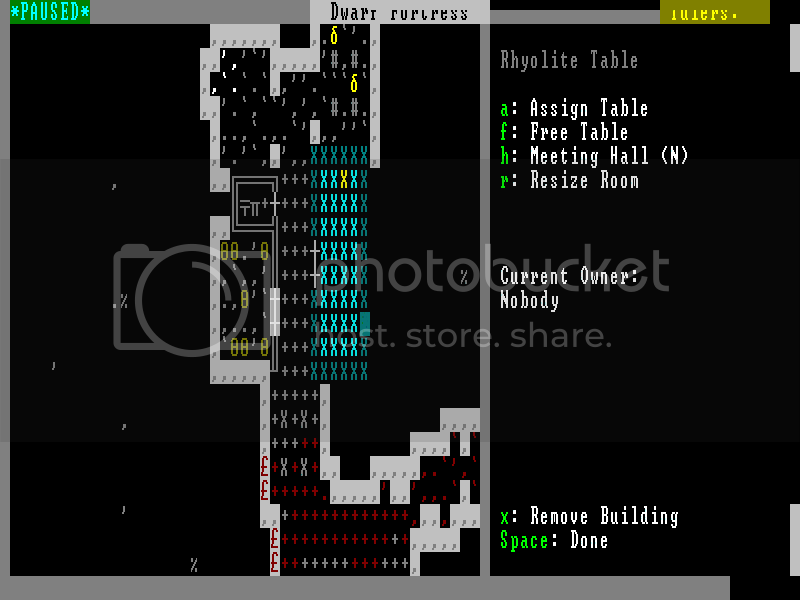 I always punch a hole through ceiling above garbage pits, then floor (or grate) over that hole just in case some kobold decides to dangle in Mission: Impossible style. I noticed the image width problem earlier. And, in fact, skaldicpoet9 gave us some insight. One thing to note; If you try to post images on the TIGSource forum but they're too wide, it seems to only show a certain portion of the image. A lot of those images I posted, if you view them directly, they're wider. It's not really a big deal, but I thought I'd mention it so we're all aware of it. you'll just have to toy with the width and height a bit to get it just right (and obviously add /img to the end of the tag). I use it sometimes when I am posting larger images. Anyway...looking good, John. Man, that was a lot of immigrants. We must be doing something right! Now that you mention it, I think I read somewhere that Mayday's prepackaged DF with graphics includes a mod. I have a mod that is very unlikely to interfere with the game (I made dragons fireproof). Cats didn't have mouth to hold their victims with, so they kept dropping the dead rat, complaining about being too hurt. The fix added a proper cat mouth. That is also included in the d# versions. The only thing that's happened so far, besides Obok and I growing closer, is convincing Melbil to add more bedrooms. I told it to her last month, and she said she was going to, and gave me some line about how you'd have to be stupid not to after that load of immigrants we got. I see right through her, though. She'd be useless without me around, that's for sure. They're a little rough and filled with rubble, but the beds are being made as we speak. Good thing, too. What if a whole load of immigrants arrived at once? 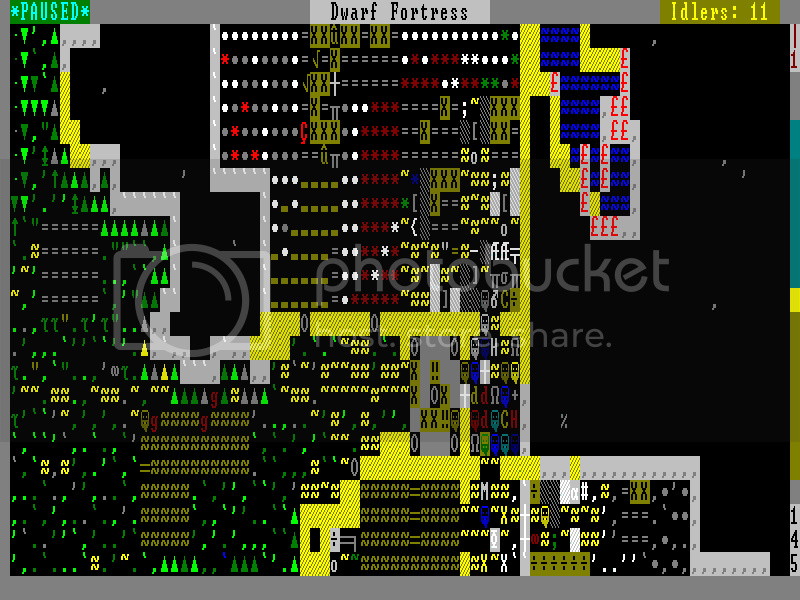 I'm not very good with social skills (you may find that hard to believe, but it's true), but I can definitely use some more dwarfpower to organize. And if there are any, they'd be arriving tomorrow. I hope some will arrive. Nothing yet. Maybe they've been held up by travel troubles? I need to do something proactive to get my mind out of this funk. Ah! I know. "Melbil. Move the refuse away from the kitchens." "What? Why are you- oh. Amost." She made a noise like a cow- a sort of haunting moo. "Listen, Amost, while I appreciate you trying to help, it is long past the point of-"
I, of course, wouldn't tolerate this change of subject. I kept repeating this until she got it, then left. I was moving an empty barrel from the stockpile, and I heard a bit of mining being done from the direction of the kitchens. Should be done soon! Well, it's done. There is now a separate garbage room off of the kitchen. An aquatic wonder, eh? I saw it, and was simply enchanted. Unfortunately, it went to someone who was actually a regular miner. Understandable; we can't have important items like picks be put in a cabinet to be admired when they could be doing real work. They also agreed to pay extra for a random assortment of items from our workshops. Spears, toys, gems, and cheese? I half suspect them to be merely naming off a list of the first things that pop into their heads, just to foster a good trading relationship. I can't imagine them trading for higher prices elsewhere in the route, given that they're paying more than double the standard price for some things. Baffling experience today. 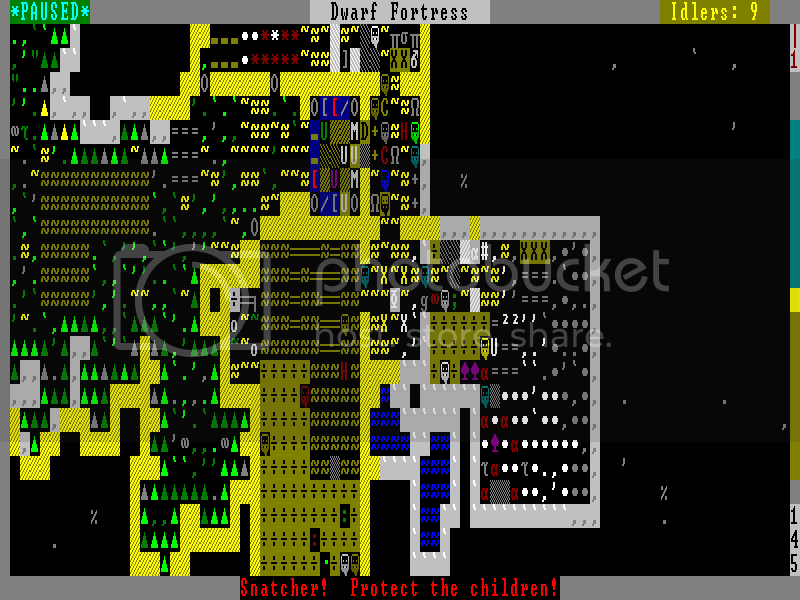 A goblin babysnatcher showed up in our fortress. She was chased off quickly, which is a relief, but part of me is still confused. We have no babies in here, and while there are a few children, they're old enough and strong enough that I feel sure they could have ground the poor gobbo into a paste. She was a scrawny thing, even by goblin standards. The new bedrooms are on their way to being complete, anyway. Sometimes I'm so busy, some things slip right by me. Like this. It's of incredible quality, and I have no idea where it came from. I admit to being a bit mystified as to why the artist would engrave a picture of a dwarf watching a human killing goblins, but the artwork is so incredible I was absorbed for nearly an hour. I do wish I knew who the artist was. Alåth is getting married! She was running to and fro throughout the fortress, babbling about it. Apparently, she's having a party right now, although I'm not going. 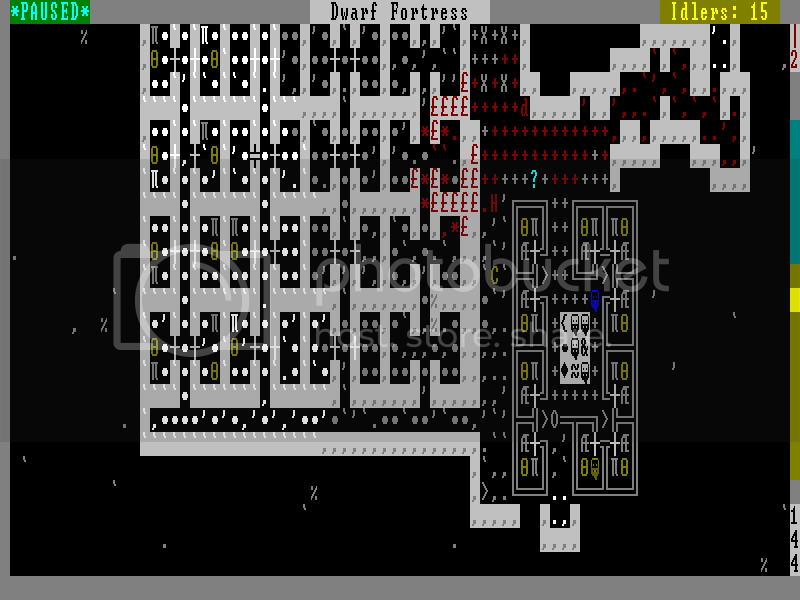 have to put this entry on hold; the fortress is under attack! I had almost forgotten about this journal... it was all dusty! I think it's finally calmed down around here a bit. Things went to hell for a while, but everything seems to be under control now. Let me try to remember everything I can for the past couple months... 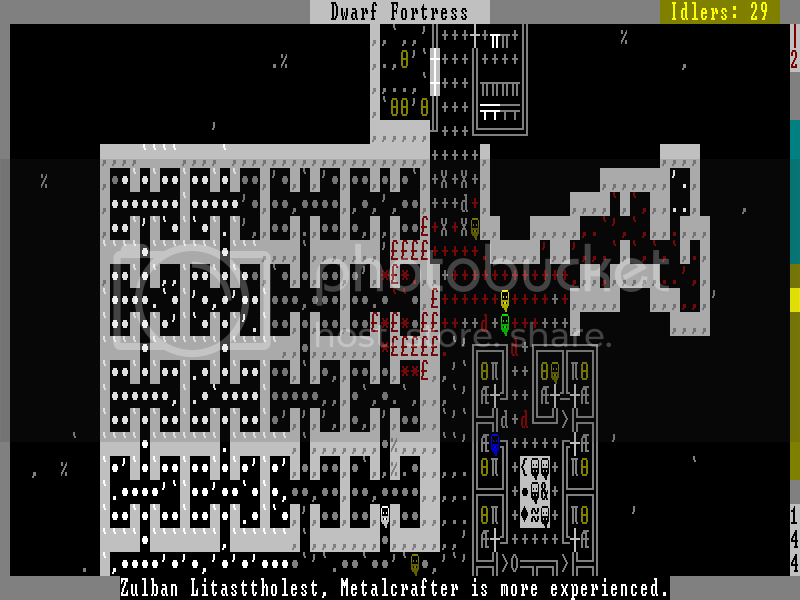 It all started when the fortress was ambushed by goblins during Alåth's wedding party. I'm going to try an encapsulate the months of confusion that followed as best I can. At any given time, several things were happening at once, so forgive me if things are not as clear as they could be. You see, apparently Melbil issued an order that no dwarf was to venture outside. However, due to an obscure statute describing "outside" as "any place lit by the sun," the room near the entrance of the fortress was officially outside. As a result, everybody had to walk all the way around anytime they wanted to get any work done. What's more, Melbil seemed to rescind and reinstate the order as she pleased, trying to make it possible for some semblance of normal life to be done whilst maintaining control. This would have been effective, were it not for certain elements who, apparently, loved the outdoors a little too much and doors that were left unlocked. Several dwarfs ran outside the moment they were able, and met a swift end as a result, due the goblin battle squadron waiting just outside the front doors. This fellow, sadly, fell to the bottom of a pool, and his corpse was irretrievable. At the same time, some dwarfs were drafted into the military, and were training around the clock, hoping to build up enough strength to take on the goblins. And, to add yet more confusion to the mix, an elven caravan arrived in the middle of the assault, and were quickly set upon and slaughtered. I didn't care so much about the drivers--they knew the risks when they set upon the path of a traveling merchants, not to mention the simple fact that they were elves-- but there was one innocent creature who died in the slaughter. One who never deserved such an ignoble death at the hands of foul goblins. 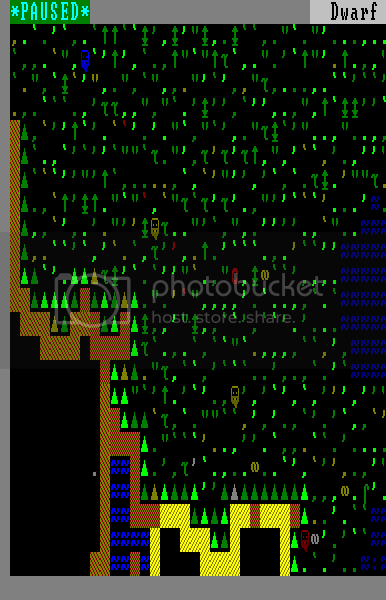 I organized a funeral march, although some of the other dwarfs looked at me strangely.